As an expandable smart home solution with numerous optional sensors, this starter pack has plenty of further potential in terms of protecting an extensive property. But as a single surveillance setup, it lacks the resolution and features like security lighting which are found on rival cameras. 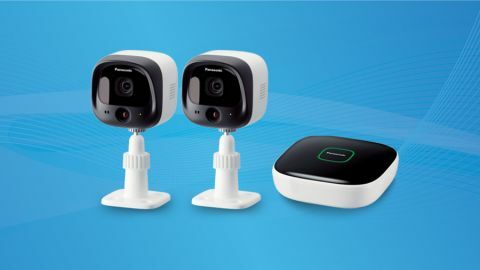 Rather like Samsung’s successful SmartThings home monitoring kit, Panasonic has launched its own system that puts the emphasis on security and in this starter pack – priced at £250 (around $305, AU$405) – it concentrates on surveillance. Another difference is that it uses DECT (Digital Enhanced Cordless Telecoms) to communicate between the hub unit and the two bundled cameras, making it virtually hack-proof and giving it a much wider range (up to 300m), which better suits commercial premises. With two wireless IP55-spec waterproof cameras included, you can keep tabs on the perimeter or interior of your property, with alerts being sent to your smartphone, or indeed, your DECT landline if you wish. Once you have your cameras set up – and this is surprisingly easy thanks to the ‘push-pairing’ procedure – you might be tempted to add Panasonic’s window lock and water leak sensors, but for now, we’ll concentrate on what’s in the box. Unlike most of the CCTV cameras we’ve tested, like the Nest Cam Outdoor to give an example, Panasonic’s wireless cameras require a communication hub unit. This square plastic device looks rather smart mounted on the wall, where it can be wired to your Wi-Fi router and the mains. The hub connects via Wi-Fi to your phone, but to the two cameras by the more energy-efficient and secure DECT protocol. The cameras have a smooth plastic waterproof design, and can be mounted on their metal pivoting brackets for wall or ceiling mounting, inside or outdoors. Their dangling power cables are fixed and quite long, so they should reach back inside the property before connecting to their respective power adapters, which are not weather-resistant. After we had chosen suitable locations for the cameras and screwed them in place, the rest of the installation process took just a few minutes thanks to the helpful companion app. Panasonic’s Home Network app is a free download to your iOS or Android device, and it walks you through the connection of the hub to your home network. The cameras are even quicker to connect thanks to the aforementioned push-pairing nature of the DECT communication system. In short, it’s slightly simpler to install than Samsung’s SmartThings setup. Each identical camera is equipped with IR motion sensors that can detect movement up to 12 metres away in the dark. You can choose between VGA image quality and even lower resolution, but we wouldn’t recommend compromising the very limited picture quality even further. These cameras also offer two-way sound. The hub unit’s microSD card slot is crucial because it allows you to store up to 32GB of video locally, so you don’t need to sign up to any expensive cloud storage subscriptions as with Nest and the like. A 4GB microSD card is supposedly bundled with the pack, although there wasn’t one in our review sample, sadly. Using the app, you can choose to record seconds or minutes of video whenever the motion sensors are triggered and/or set off the hub alarm. Yes, the hub on the wall also acts as a flashing, bleeping burglar alarm. The cameras worked successfully in sensing motion and capturing video of ourselves pretending to burgle our own office, both in daylight and in the dark. However, the big downfall here is the picture quality. In an era of 4K resolution, VGA just doesn’t cut it anymore. The image quality is too low to identify faces or car registration plates, and in low light there’s a further drop in quality. The 0.3-megapixel sensor that Panasonic is using here simply isn’t good enough. It’s a similar story with the audio. The microphone and speaker can just about get the message across, but you can expect to sound like a Dalek (mind you, that might have its advantages when trying to scare intruders). The motion detection worked every time, recording video clips on the microSD card and sending alerts to our iPhone. However, there’s quite a delay, which meant that on some of the recorded video clips, the pretend burglar had already dashed past, and didn’t appear on film at all.